TMI LIVING | It's A Lifestyle! Jerry Garcia of the Grateful Dead once said: “What a long, strange trip this has been.” Sony Pictures Entertainment hacked by cyber-terrorists. Stolen data. Wiped company hard drives. Private internal emails given to media outlets. Private messages, photographs, and contact data of some of America’s biggest movie stars made public. Entire scripts of movies either in pre-production, production, or post-production made available online. Threats made against certain movie stars. Threats made against executives of Sony Pictures. Threats made against President Obama. Terroristic threats made against American movie theater chains and any Americans patronizing those chains. Extortion plots. Sony Pictures capitulating. The President publicly calling Sony’s decision “a mistake.” Sony Pictures un-capitulating. The President praising Sony. North Korea condemning Sony. North Korea condemning the President – even resorting to racially insensitive language to show its displeasure. North Korea threatening the United States. North Korea having its worldwide web and mobile network access mysteriously/not-so-mysteriously shut down. Whoa, Nelly. What butterfly effect is in play here? Where is the MacGuffin which set into motion all of the aforementioned occurrences over the last few weeks or so? Would you believe that a single motion picture is the root of all this? Ladies and gentlemen, welcome to the “Interview” saga. In case you didn’t know, “The Interview” is an action-comedy produced by Sony Pictures starring Seth Rogen and James Franco. According to IMDb.com, here is the film’s plot summary: Dave Skylark (James Franco) and his producer Aaron Rapoport (Seth Rogen) run the popular celebrity tabloid TV show “Skylark Tonight.” When they discover that North Korean dictator Kim Jong-un is a fan of the show, they land an interview with him in an attempt to legitimize themselves as journalists. As Dave and Aaron prepare to travel to Pyongyang, their plans change when the CIA recruits them, perhaps the two least-qualified men imaginable, to assassinate Kim Jong-un. The antagonist in “The Interview”? Kim Jong-un. The antagonist of real-life geopolitics? The very same Kim Jong-un. While it is true that life imitates art (and vice versa), North Korea’s “supreme leader” apparently didn’t get the memo. As one might imagine, he lost it over last summer when details of “The Interview” began surfacing. The film is now in theaters and available via digital download. Could the screenwriters of “The Interview” (Mr. Rogen and Evan Goldberg) have changed the name of the film’s bad guy? Sure. Could they have created a fictional nation? Of course. Could they have gone in a totally different direction in terms of the appearance and/or mannerisms of the antagonist? Absolutely. However, they didn’t, and that’s ok. In America, that’s show business, satire, and comedy. It’s the freedom of expression. That’s how we get down in the land of the free. In North Korea however, it’s blasphemy, an act of war, and the basis for an attempt to invoke an unprecedented campaign of censorship and intimidation globally. Kim Jong-un is having a full-fledged temper tantrum – and you have a ringside seat for the shenanigans. The week before Christmas, the FBI’s investigative finding was that the hackers – known as the Guardians of Peace – conducted their November cyberattack with North Korea’s knowledge and assistance. President Obama promised the American people an appropriate response when he said, “Some the things we do, you will hear about. Some of the things we do, you will not hear about.” Never one to leave well enough alone, Kim Jong-un then referred to the President by a racial slur in a released statement. Less than 24 hours later, North Korea found itself back in the days of dial-up internet. Coincidence? I think not. As for Vladimir Putin – Kim Jong-un’s BFF – you’ve heard complete silence. Crickets. 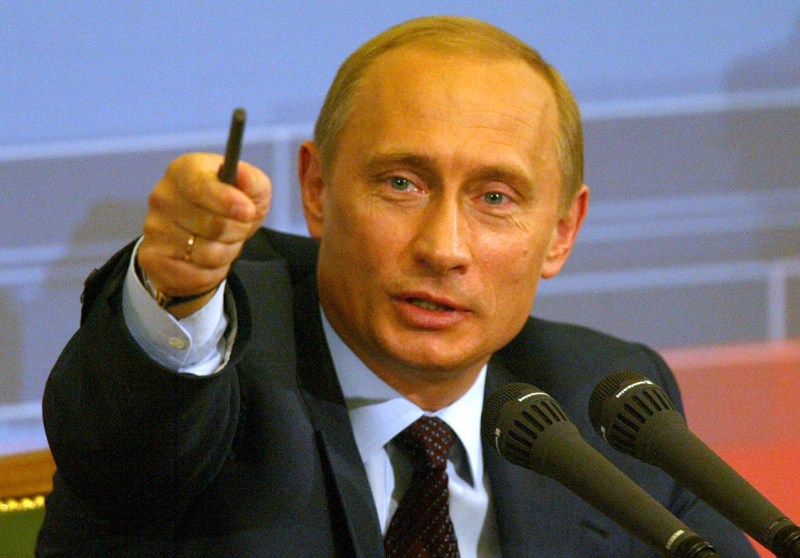 The Russian President currently has Obama-led problems of his own. You can read more about that in my next column, “Cancel Christmas.” Consider that a tease. One thing’s for certain: the US Cyber Command is for real. Those operatives do not play. Will “The Interview” be a big hit after all? Will Kim Jong-un chill out? What’s President Obama’s next move? The “Interview” saga continues. Happy New Year! A glimpse of green and red? 15 species of hummingbird are common in the US and Canada. 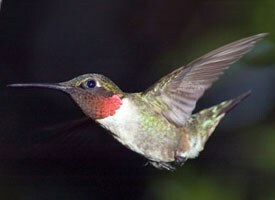 The ruby-throated hummingbird is our local visitor to the Mid-Atlantic region. But aren’t ruby-throated hummingbirds too small and too shy to observe in schoolyards and gardens here? 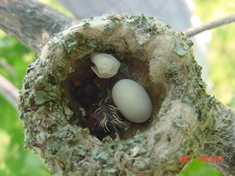 Hummingbirds will come to schoolyards as well as home gardens. 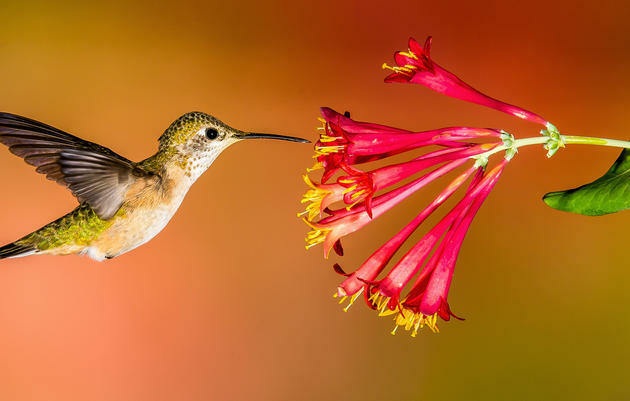 The key factor to attract ruby-throated hummingbirds is that they need their preferred food sources: tubular, mostly red-flowered nectar-producing plants. 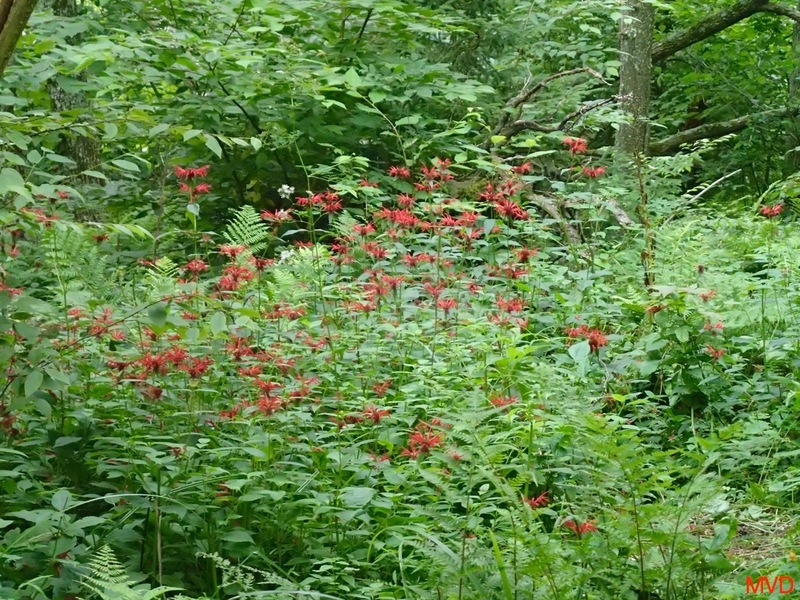 Red Columbine, Coral or Trumpet Honeysuckle, Scarlet Beebalm, Cardinal Flower. 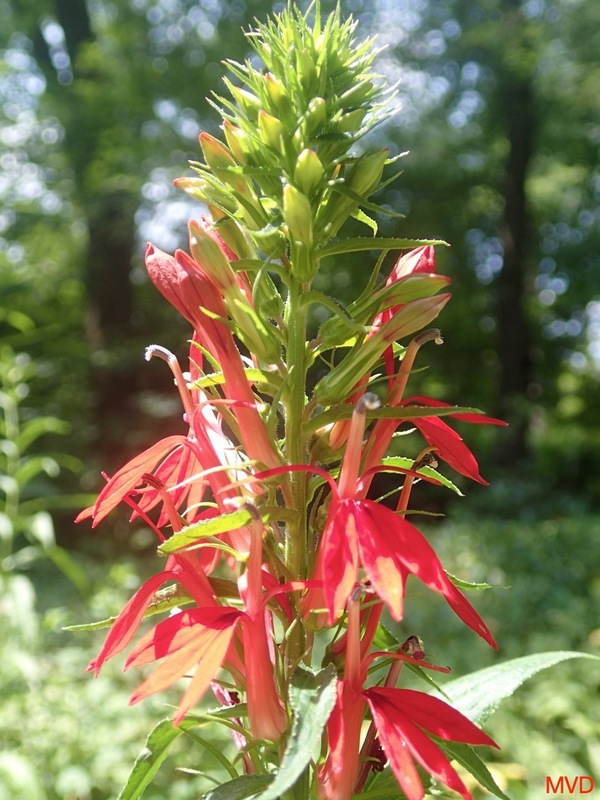 You will notice all these plants have the red tubular flowers that the hummingbirds enjoy feeding from. 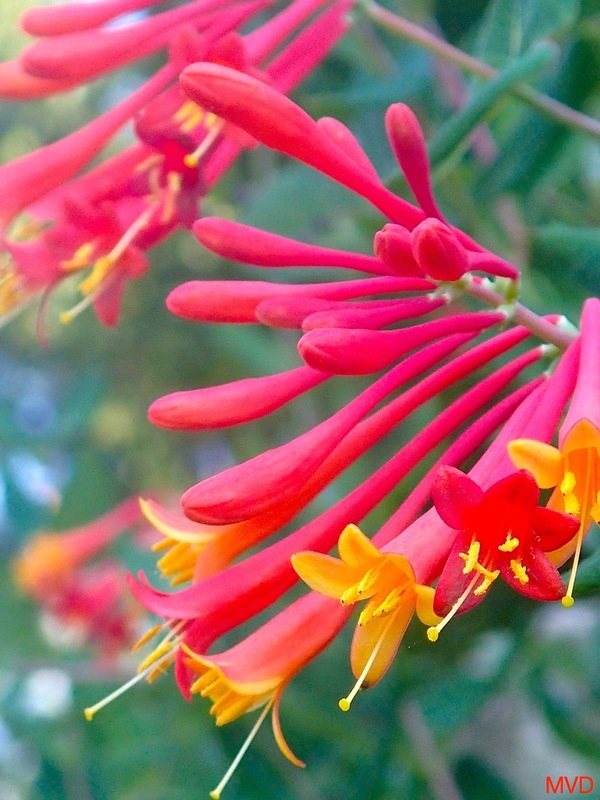 I’ve also seen hummingbirds in my yard feeding from the eye-catching yellow early spring-flowering Carolina Jessamine, orange Turk’s-cap Lilies (Lilium superbum) and coral-colored Agastache rupestris. 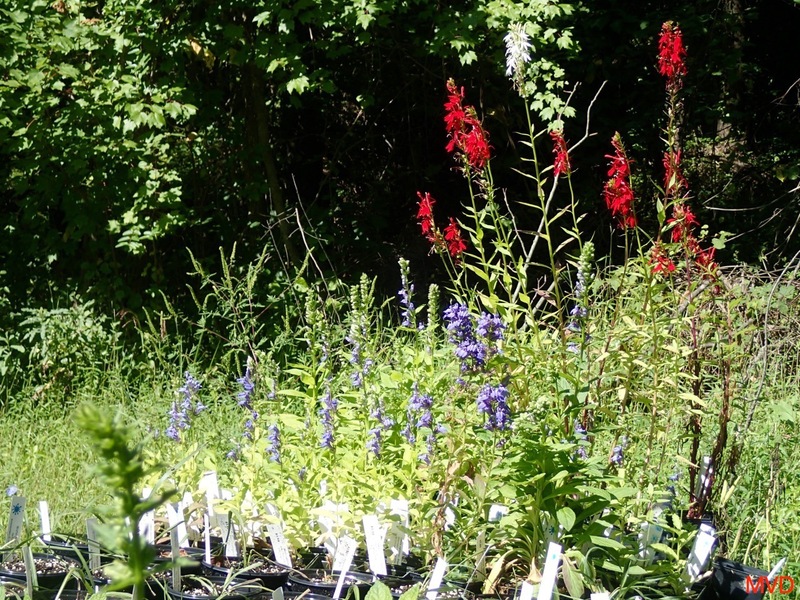 For native plant resources local to Northern Virginia consult Plant NoVA Natives. Toni Genberg, Arlington Regional Master Naturalist and partner author of the inspirational and informational blog ChooseNatives.org, lists resources for native plants in the Mid-Atlantic region. Toni, in addition to native plantings, recommends an easy-to-clean hummingbird feeder such as the Dr JB’s feeder. 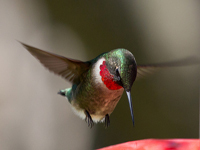 Study hummingbirds and recording observations, and arrival and departure of visiting migrant hummingbirds as part of a citizen science program such as Journey North’s Hummingbirds or Audubon Society’s Celebrate Hummingbirds. The datasets compiled over years contribute to our understanding of climate change. Reflect on the moment of delight and wonder. Here’s my poem about a hummingbird I saw and heard last year. Program with maps and apps, and learning resources to observe and record the migration of hummingbirds in your area of the United States. Your school can contribute data and record their arrival and departure in your area. A national citizen science program focussed on the timing of plant cycles (phenology). 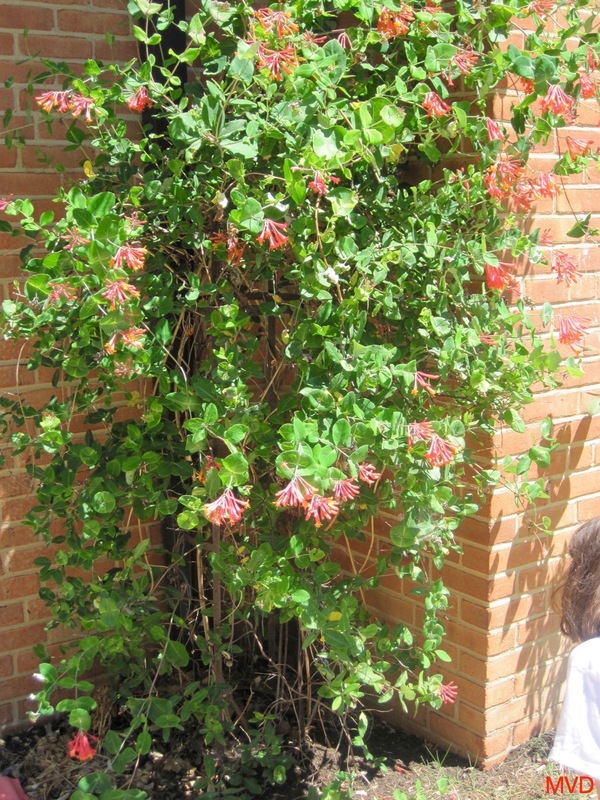 Observe and record the time of the budding, flowering and seeding of flowers such as Aquilegia canadensis in your schoolyard. 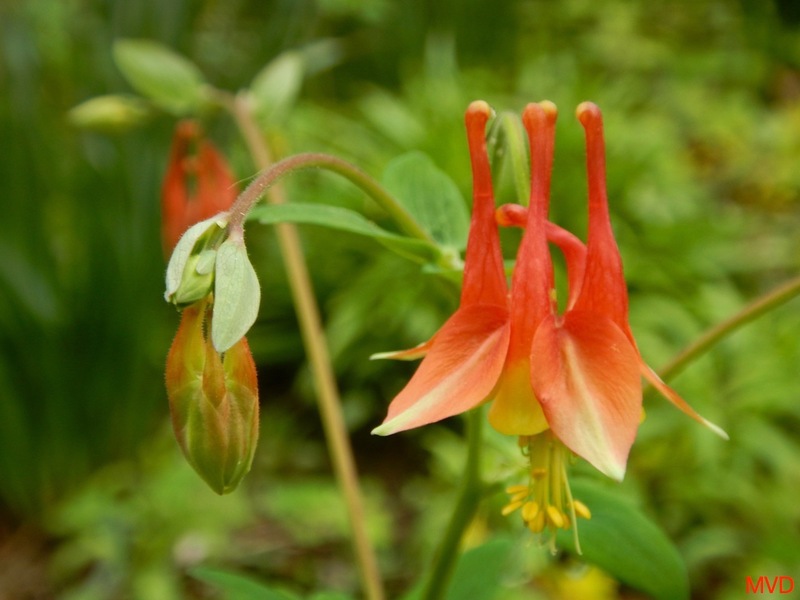 This year the Aquilegia is out in my yard one week prior to my hummingbird first sighting. Download the Hummingbird app to record your sightings and contribute to citizen science. Native Plants for Northern Virginia – www.plantnovanatives.org for further information on native plants in Northern Virginia, demonstration native plant gardens and local resources. Thanks to Toni Genberg (ChooseNatives.org) for inspiration and insight. Posted in TMI Living ~ It's A Lifestyle! The late, great comedian Richard Pryor had many sayings I found to be completely hilarious. Naturally, the vast majority of those sayings could not be printed in a family newspaper such as this one. There remains, however, one clean phrase of his I have laughed at repeatedly for decades. That particular phrase is “Cancel Christmas.” I don’t know exactly what it is about that phrase that still cracks me up. Perhaps, it was Mr. Pryor’s deadpan delivery. Maybe it was his razor sharp wit. Conceivably, it could have something to do with the fact that his phrase brings to mind a virtually impossible scenario. Think about it: who (other than the Grinch) would actually cancel Christmas? What would be the circumstances which would call for such a grim decision? Who would subscribe to the cancellation of the celebration of Jesus’s birth? Ladies and gentlemen, there will be no Christmas in Russia for 2015. No joke, no punchline. President Vladimir Putin didn’t postpone the holiday, he cancelled it – and President Barack Obama has more than a little to do with his decision. I say again: Mr. Putin has cancelled Christmas. Last week, the Russian President officially banned government workers there from taking any vacation or personal leave time during the entire month of January. Employees at Russian companies and government officials are typically entitled to time off between January 1st and January 12th. Not this year. Which means no celebration of the New Year – Russia’s primary holiday. And that also means no observance of Orthodox Christmas on January 7th. Mr. Putin as Ebenzer Scrooge? Or Vlad the Impaler? Say it ain’t so, сэр. Why would he make such a drastic move? The answer is financial. President Putin said: “For the government, for your agencies, we cannot afford this long holiday, at least this year – you know what I mean.” Please allow me to elaborate, good people. Russia’s economy is currently in recession. Current projections has its economy shrinking by 4% this year. Its deficit is rapidly growing. Russia’s oil prices are dropping like an anvil from a naval ship. Russia’s currency – the rouble – has seen a steep decline in its value against foreign currencies like the American dollar. Credit in Russia is tight to the extent of being non-existent. Trust Bank – Russia’s biggest bank – was in such dire straits that the Russian government was forced to put into place a system to bail it out in order to prevent it from failing. What does this all mean for the average Russian citizen? Please think back to the fall of 2008 here in the United States when the banks deemed too big to fail were failing. Companies closed. Jobs disappeared. The real estate bubble burst. Banks were either unable or unwilling to lend money. Small businesses failed. Gas prices soared. Food prices skyrocketed. Pensions suddenly became insolvent. Entire industries teetered on the edge of oblivion. You remember all that, right? You recall how bad it got for most Americans then? It’s pretty much the equivalent for the Russian people right about now. Have you seen gas prices around here later? I saw unleaded fuel in Valdosta at $2.10 a gallon – and that was almost two weeks ago. It is surely lower now. You know you love seeing gas prices at the lowest point in years. Well, Russia’s economy is largely dependent on oil/gas prices. There’s a direct correlation between Russia’s economic maladies and what we’re paying for our gas here. Here’s where the President enters the fray. During his re-election bid in the fall of 2012, President Obama was relentlessly attacked by Mitt Romney and the Republican Party for gas prices in the US. They claimed President Obama wanted preposterously high gas prices. Then, they claimed that he was secretly in control of the gas prices. Some media pundits even declared that the high cost of gas would be the main reason Mr. Obama would lose to Mr. Romney. On those three points: no, wrong, and sorry. I’m curious, though. Since the President took all the blame for the cost of a gallon of gas in 2012, shouldn’t he get credit for the same in 2015? Anyone? Bueller? Clearly, the waves of economic sanctions President Obama inflicted upon Russia earlier this year for its hostile actions against Ukraine have now brought the Soviet bear to its knees financially. At the President’s urging, the UN followed suit. So did various European countries. Mr. Putin is cornered. He can stay the course in Ukraine and watch the Russian people suffer – or he can lose face and save Russia from a full-on recession. Either way, he loses. Attention, GOP: your poster boy for decisive action has been checkmated by President Obama. Mr. Putin cancelled Christmas! Richard Pryor’s catchphrase was actually true. Who knew? Do you enjoy raki ng leaves, have a yard service pick them up or decide to mow and mulch the leaves? It’s the time of year to put “fall leaves” on your Garden To-Do list. It’s also time to review your garden. Celebrate what worked this year, and figure out what didn’t and why, and plan for the spring. What else could be on your checklist to “put your garden to bed for the winter”? Harvest any tomatoes or peppers. If the tomatoes are still green, place them on window sill and they will ripen up off the vine. Continue to harvest fall-planted radishes, kale and greens. The first frost brings out the flavor of cabbage-family crops. And you can over-winter the root vegetables: carrots, beets, parsnips and leeks. Protect the cool weather greens over the winter in a hoop house or other season extender – and continue to harvest all winter long. Clear any dead plants – move to compost heap or cut up and mulch in place. Remove any diseased plants or weeds that might harbor pests and put in the trash. 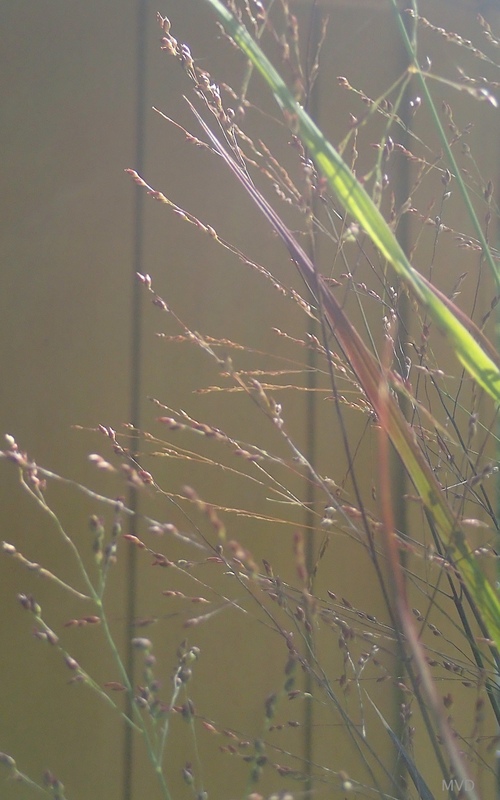 Leave ornamental grasses for winter interest and clip back in early spring. Do a soil test – particularly for vegetables, flowers or lawn. Consult your Extension service, and in Virginia send samples to Virginia Tech’s laboratory, details at http://www.soiltest.vt.edu/index.html. Remember that our soil here in Northern Virginia is usually acidic, but some areas are basic. On recently disturbed soil, or where you see plants failing to thrive you may be surprised by the results of your soil test. Follow instructions from the lab results to amend your soil’s pH and balance nutrients for spring planting. Dig out compost “the black gold” from your compost bin and add to garden beds. Sow a cover crop. 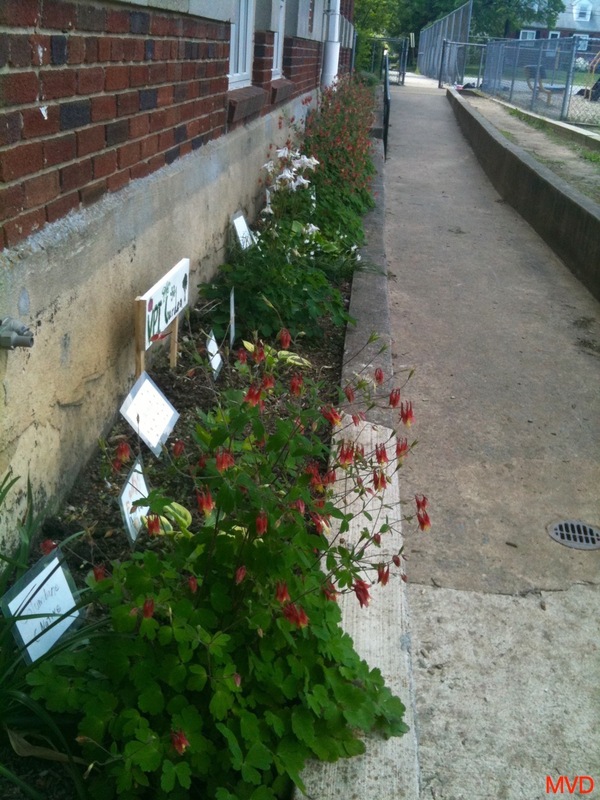 You could try sowing winter rye, buckwheat, or leave winter weeds such as chickweed and bittercress to winter over and pull in the spring. Prune Butterfly Bushes (Buddleia) to about 9-12 inches above the soil – or better yet pull them out as they are now considered invasive. Replace a Buddleia with a native shrub that also attracts pollinators, such as Itea, Clethra, or a Buttonbush. Prune roses to about 2 or 3 feet, and prune again in late winter. Leave pruning trees and other shrubs to later in the winter or early spring. Protect delicate plants such as herbs with a row cover or plant blanket. Row covers are a polyester or polypropylene fabric that is permeable to light, air and water and keep covered plants 5 to 10 degrees warmer than the ambient temperature and protect plants from wind chill and rain damage. Anchor well to prevent row cover or plant blanket from flying away. Build your own hoop house as a season extender and grow lettuce and greens year-round. Wipe soil off blades, and replace any broken items. Are you putting tools on your holiday wishlist? Clear up fallen leaves particularly around mature large-leaved trees such as oak, sycamore and maple. You can shred, and add the leaves to a compost heap. Add leaves as “browns” to your compost heaps ingredients along with nitrogen-bearing “greens” of grass, vegetables and green trimmings to make a balanced pile. You can leave leaves curbside for the county to compost. Brush the leaves to an empty space in a garden bed and dig in to compost in place. Leaves on the lawn can also be recycled in place, simply shred with the mower. Apply a fall fertilizer, about a pound of nitrogen per 1000 squa re feet, to speed up the decomposition of the shredded leaves and boost grass plants. Or rake leaves into a heap, and use between Thanksgiving and the winter holidays to protect tender perennials from freezing winter weather once the plants are dormant. Add a layer 3 – 6 inches of leaves over a tender plant. Look through seed catalogs, favorite plant lists, and research and read about gardens you like. Ask the horticultural experts at your local Extension office and garden centers for advice.Enjoy planning and budgeting for your next year’s garden! Consternation is a noun – and is defined as “feelings of anxiety or dismay, typically at something unexpected.” Synonyms of consternation include distress, discomposure, and panic. Consternation aptly describes what most Americans are feeling right now about the Ebola virus outbreak – especially at the news of two American healthcare workers in Dallas contracting the disease. The aftermath of these developments has brought about a barrage of conspiracy theories, xenophobia, and a wave of isolationist thinking. It’s knee-jerk reaction theater, folks. Our great nation has recently become conster-nation. The United States of America is, has been, and will continue to be a nation of immigrants. Very few people in leadership want to think about that, speak about that, or acknowledge that in the present tense. Too many of our elected officials are too busy promoting dog-eat-dog mindsets, declaring that our borders must be sealed off, and spreading the pseudo-gospel that everyone is on their own. These notions are childish, and offer nothing in the way of a meaningful response to a legitimate healthcare crisis. The ebola viral disease (EVD) was discovered in 1976. According to the renowned Mayo Clinic, Ebola virus and Marburg virus are related viruses/filoviruses that cause hemorrhagic fevers — illnesses marked by severe bleeding (hemorrhage), organ failure and, in many cases, death. The Centers for Disease Control (CDC) cite these symptoms of ebola: fever (higher than 101.5°F), severe headache, muscle pain, weakness, diarrhea, vomiting, abdominal pain, and unexplained hemorrhage (bleeding or bruising) from the orifices of the body. Symptoms may appear anywhere from 2 to 21 days after exposure to Ebola, but the average is 8 to 10 days. Since its discovery, outbreaks of EVD have occurred only in its indigenous region – West Africa. Outbreak-themed movies and 24-hour news cycles have helped perpetuate a collective sense of gloom-and-doom. On planet earth, there are only three nations currently dealing with rampant outbreaks of the ebola virus: Liberia, Sierra Leone, and the Democratic Republic of Congo. It should be noted that in those three countries, there is only one doctor for every 100,000 residents. Think about that. We have more physicians at Archbold Hospital than the entire country of Liberia – which has a population of nearly 4,500,000 people. Hospitals in West Africa are few and accessible only by foot or motorcycle. Ambulances are reserved only for pregnant women there. To stop the ebola virus, Liberia, Sierra Leone, and the Democratic Republic of Congo don’t require American soldiers or guns or weapons. Those countries require funding. Those countries need medications, gloves, protective suits, and facemasks. To effectively deal with EVD, the nations of the world need to do one of two things:  jointly provide those West Africa countries the money they need to acquire these things, or  jointly provide those West Africa countries with all the medical supplies they so desperately need. been made publicly that leaders and medical professionals may be lying to us. Those suggestions are completely without basis in fact. There is no evidence of any kind, of which we at Fox News are aware, that leaders have lied about anything regarding Ebola… being afraid at all is the wrong thing to do. The panic that has tanked the stock market and left people fearful that their children will get sick at school is counterproductive and lacks basis in fact or reason. There is no Ebola spreading in America. Should that change our reporting will change. But there is nothing to indicate that it will.” Well said, Mr. Smith. Quite fair, quite balanced. Travel bans would increase the spread of ebola, not contain it. Ebola is not a weapon. Its victims are not villains. We should replace our consternation with compassion. 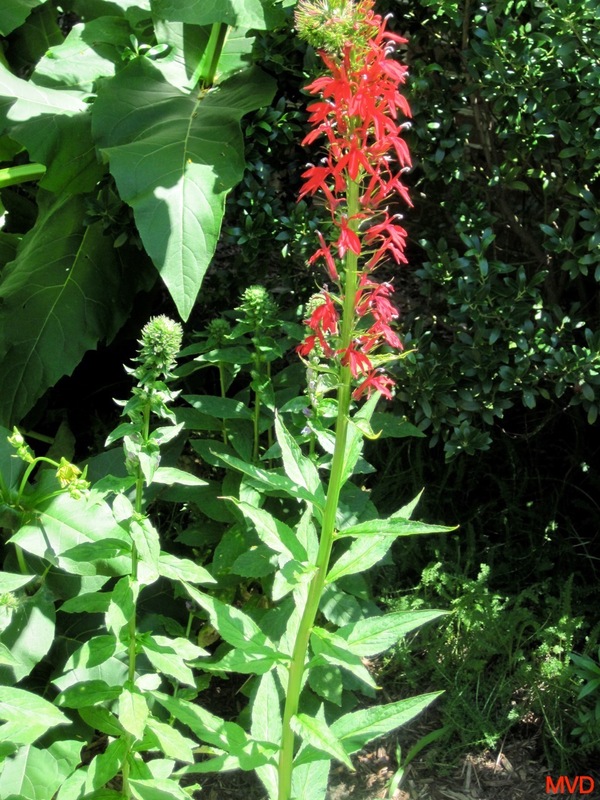 Here are flowers and grasses for September and October in Northern Virginia and the East Coast. 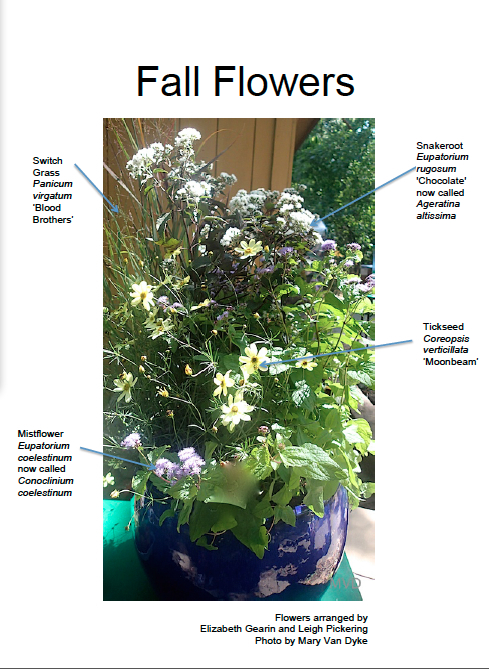 This arrangement was made by Elizabeth Gearin and Leigh Pickering for an Audubon Ambassador’s class on container gardening with native selections – you could make one too as a weekend project! The choice of a blue-glazed pot can certainly add beauty to a balcony or patio, and these native species and cultivars are available at our large local nurseries. 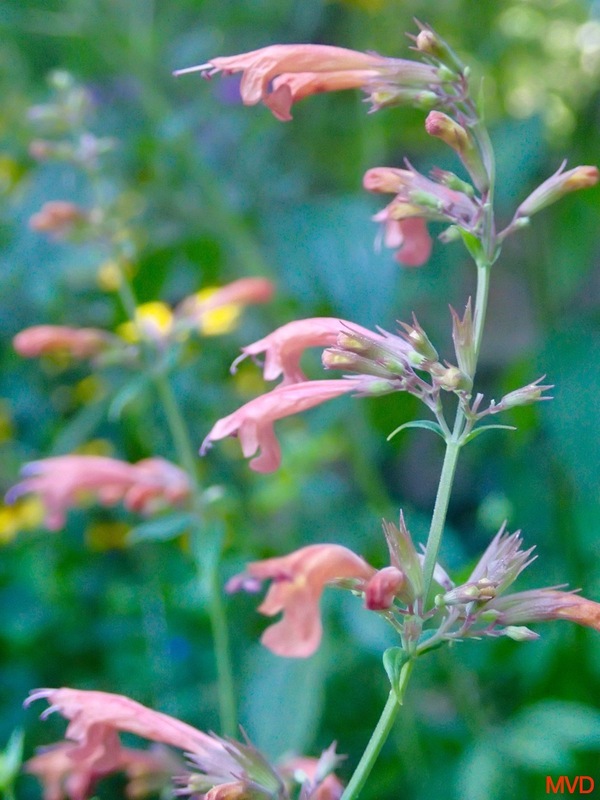 Switch grass thrives best in sun to part shade, and has pink showy and airy flowers in late summer. 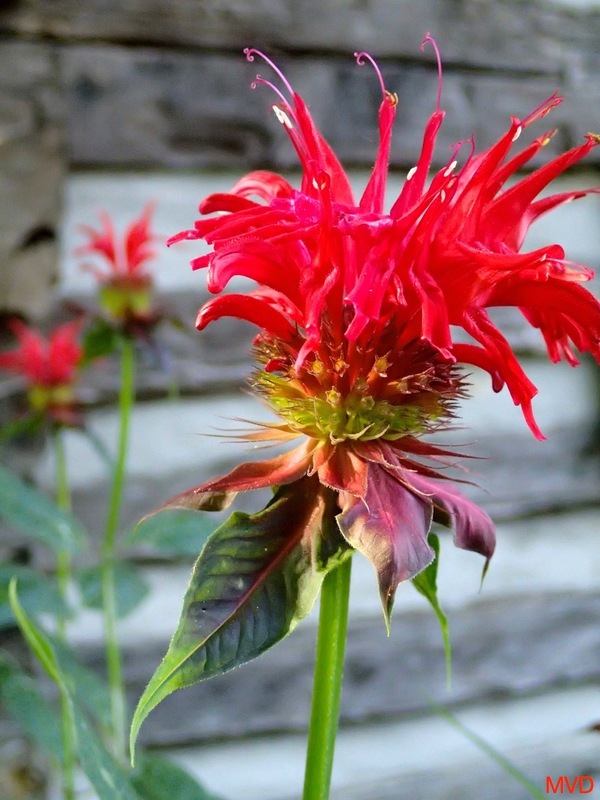 This 3 – 6 foot high cultivar ‘Blood Brothers’ has slightly red leaves and gives winter visual interest to the garden or container. Switch grass can also feature in a garden as an accent plant or massed in groups and might be in a rain garden. The grass is easy to grow in a range of soils. Seeds provide winter food for sparrows and other birds. Cut back clumps in late winter early spring. Have you read about biofuels? Some switch grasses are being grown in Virginia as experimental fuel sources as they efficiently store carbon and produce more energy than corn. However this cultivar has been bred to be ornamental! 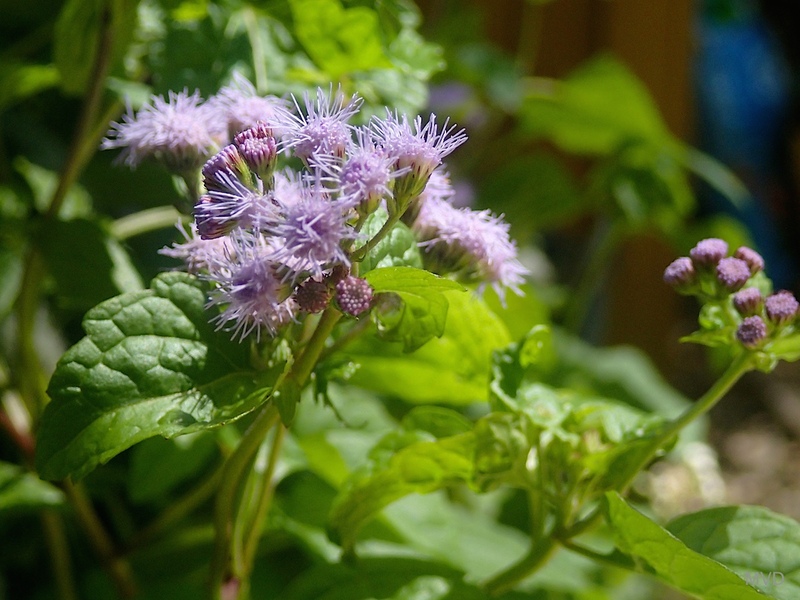 Mistflower adds a purple hazy beauty to the garden or a container arrangement flowering late in the season from July to October. Mistflower thrives in shady areas and can tolerate moist to dry soils. 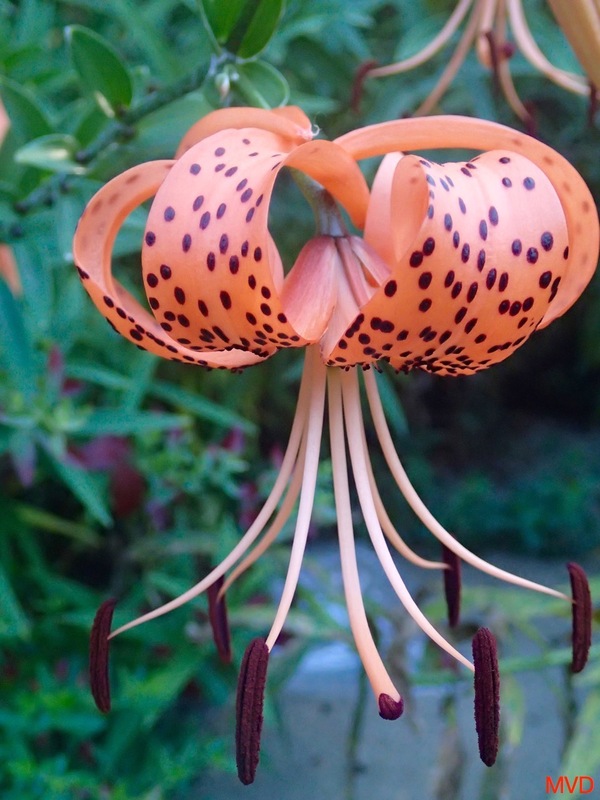 It provides late season nectar attracting beneficial insects as well as butterflies and providing seeds for songbirds. The beautiful white flowers of Snakeroot add sparkle to the arrangement whether in a container or garden and the chocolate leaves and purple stems of this cultivar add some contrast. Note that the purple foliage is likely to be darker in the sunshine – and may be green in the shade. 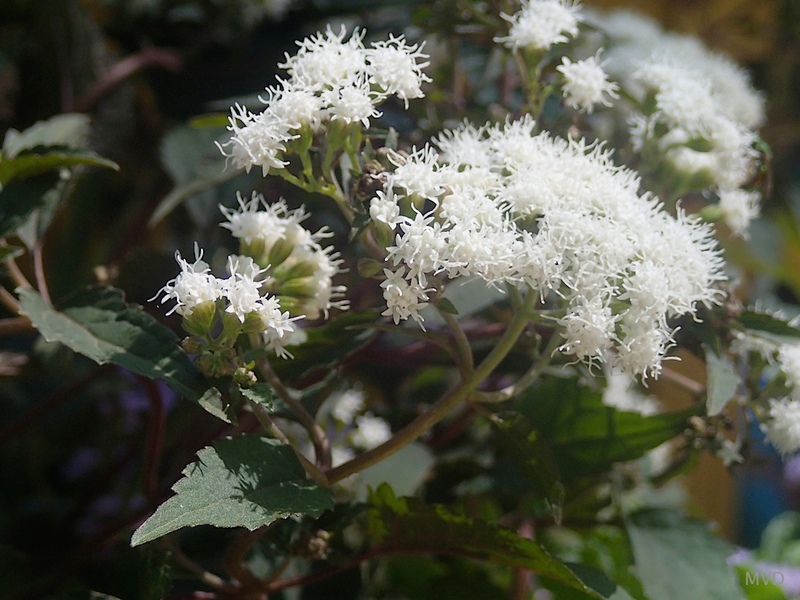 The white flowers of Snakeroot complements the purple mistflower and they grow well together. Please note that Snakeroot is toxic to humans. Cows, sheep and goats that feed on Snakeroot have poisonous milk. The story goes that Abraham Lincoln’s mother might have died from cow’s milk contaminated by Snakeroot. Snakeroot is native to woods in dappled shade and it is tolerant of full sun and shade too. Butterflies and other insects appreciate the flowers as a late summer nectar source. Cut the plants back in early spring. Snakeroot prefers slightly alkaline and moist soil if possible. Tickseed has long a blooming season and can flower from May to October. The plant grows well in full sun to part shade, thrives in dry well-drained acidic soil, and will tolerate our droughts – or lack of watering if you leave your container for a day or two. 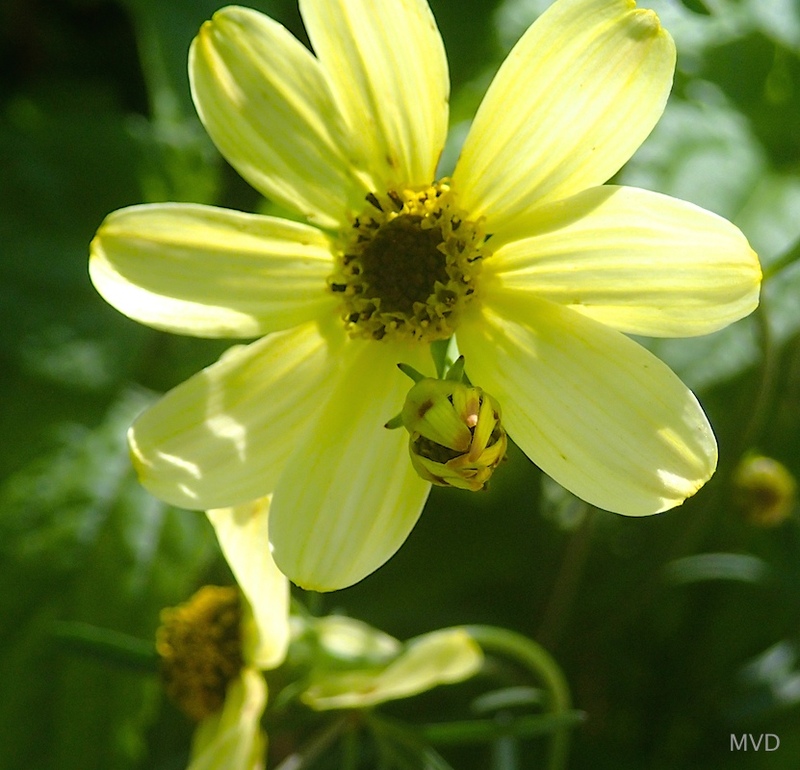 The yellow flowers are attractive to butterflies and other insects and the seeds feed birds. In the garden, you can be use tickseed as groundcover as the plant spreads by forming a mat of underground stems – rhizomes. Next post I’ll consider some fall garden chores: how to winterize your garden? Posted in Gardening, Lifestyle, Outdoors, TMI Living ~ It's A Lifestyle! It’s all beginning again. You can feel it. You can see it. You can hear it. We’re at the start of a brand new football season – for high school, for college, and for the pros. We’re at the start of autumn – when the dog days of summer typically give way to slightly cooler temperatures and slightly drier humidity. We’re all a few weeks into the 2014-15 school year – for students at every educational level. For those who pay close attention to the world of politics, we’re at the onset of the stretch run of the various political races – be they local, statewide, or national. Get ready for all manner of political bombardment: robo-calls, political mailers, email blasts, donor letters, nonstop campaign commercials on television and radio, candidates coming to your town or church or facility, even text messages to your Android or Apple devices. Conflicts between nations and conflicts between differing factions of the same faith could conceivably lead to the United States entering into a new war with an old enemy bearing a new name. Perhaps you have a new job – or maybe you have new responsibilities because you’ve recently been promoted to a newer, higher position. You may have just moved to a new town/city – which means new friends, new possibilities, and a new outlook. Whatever your current situation is – new or old, positive or negative, exciting or bland, funny or solemn – there’s a good chance you need a break. Perhaps you might consider being unplugged. Life in the postmodern world keeps us constantly on the go. There always seems to be one more errand to run, one more meeting to attend, one more place to go, one more thing to do, and one more person to meet. That’s why most of us are never further away than 6 inches from our smartphones unless we’re in the shower. That’s why many of us are hard-pressed to sleep soundly at night. We’re fearful of missing a call from our boss, a friend, a family member, or our significant other. We’re afraid of not being there. This fear, of course, can easily force us into the habit of being there too much – which could be to our detriment mentally, emotionally, spiritually, or even physically. It’s necessary to turn off the news cable channels sometimes. Once you put down the remote, consider picking up a good book to read. Those of you who are athletic might consider walking a nature trail, riding along a bike path, or intensifying your workout regimen. Get unplugged. Those of you who are holistically inclined might resume meditation, affirmation, or yoga. Get unplugged. Those of you who are community service minded can easily engage in random acts of kindness, church ministries, and mentoring initiatives. There are plenty of things you can do to help your community if/when you get unplugged for a spell. Balancing your various lives – professional, personal, recreational, spiritual, etc. – can be a complex and delicate process. Certain things are key. Proper rest, a healthy dose of inner peace, and time with family and friends are essential components to living well. My father has a piece of sage advice he’s repeated throughout my life: “Enough of anything is enough.” Well said, Dad. That phrase applies to everyone regardless of their age, gender, faith, ethnicity, political leanings, or socioeconomic status. Whenever I’m unplugged, I soon find myself thinking of how I can be of service to others. Don’t misunderstand. I’m not proposing that anyone unplug themselves from the news, from social media, and from cable/satellite television permanently – or even for an extended period of time. That would be ill-advised. You know what’s best for you. You know when to say when. You know when you need a breather. You can feel it. For some people, being unplugged for a couple of hours will work wonders. For others, being unplugged for a day or two will feel like a virtual vacation. much, you know what to do. Live acoustically. Go unplugged. Bruce Levenson believed that white people were uncomfortable attending Hawks games at Philips Arena in downtown Atlanta. He believed that the Hawks’ fan base contained too many black people. He believed that there weren’t enough affluent Hawks fans of color to buy season ticket packages. He blamed the black patrons of the Hawks for chasing away the white patrons. He felt that too much hip-hop/rap music was played at Hawks games. He thought there were too many Hawks cheerleaders who were black. Mr. Levenson even went as far as declaring that the kiss-cam at Philips Arena was “too black.” This is America – and every citizen of this great nation is entitled to his or her opinion whether most people readily agree or readily disagree with that opinion. Here’s the problem. Up until a couple of days ago, Bruce Levenson was the majority owner of Atlanta’s NBA franchise. Mr. Levenson’s beliefs were revealed Sunday in a 2012 email he admitted writing and distributing throughout the Hawks’ front office and ownership group. Mr. Levenson’s email has been the center of an investigation ordered by new NBA Commissioner Adam Silver. Not even one month after Donald Sterling was forced by Commissioner Silver and the NBA league office to sell the Los Angeles Clippers franchise for making racially disparaging comments about black people, it’s happening again. This time, it’s happening in Atlanta. And as was the case with Mr. Sterling, Mr. Levenson is about to make himself a lot of money. Dirty money. The Hawks are a national story – for all the wrong reasons. I’m curious. Was Mr. Levenson simply unaware that Atlanta boasts one of the most affluent, highly educated, and upwardly mobile group of black Americans in the entire country? Did he not know the high number of black professional athletes, actors, actresses, musicians, writers, and entertainers who call Atlanta home? Did he somehow forget Atlanta’s place as the civil rights capital of America? The late, great Reverend Dr. Martin Luther King, Jr. was born and raised in Atlanta. The Clark-Atlanta University Center (CAUC) is comprised of Spelman College, Morehouse College, Clark-Atlanta University, the Interdenominational Theological Center, and the Morehouse College School of Medicine. The CAUC is widely acknowledged as containing of the best historically black colleges/universities in the world. Furthermore, the 2010 United States Census Bureau found the city of Atlanta’s population to be 54 percent black and 38.4 percent white. Mr. Levenson may not have been born in Atlanta, but he lived in Atlanta. If he didn’t know these things about the city before, he should have over the course of 9 years as principal owner of the Hawks. As a highly successful businessman, he should have made it his business to know these things. Ignorance is not an excuse. Examine Mr. Levenson’s words for yourself: “I think southern whites simply were not comfortable being in an arena or at a bar where they were in the minority. My theory is that the black crowd scared away the whites and there are simply not enough affluent black fans to build a significant season ticket base.” Southern whites? What year is he in? I commend Mr. Levenson for self-reporting his email to the NBA league office. I commend Mr. Levenson for deciding to sell the team. I believe that he regrets his inflammatory comments, but has he learned anything? Will this make him a better person? I pray so. Whether you’re the owner of an NBA franchise or the owner of a nail salon, the primary color should be green – not black or white or brown or red. If you provide a service that is buzzworthy, consistently good, and customer-service friendly, the clients will patronize you faithfully and joyfully. Mr. Levenson either forgot this standard or willfully chose not to observe it as the majority owner of the Hawks. Meanwhile, ownership groups are forming for the expressed purpose of overpaying Mr. Levenson for his ownership stake. city (Seattle? KC? Pittsburgh?). The next owner may spend whatever is necessary to assemble a championship caliber team or allow the Hawks to be human shields for better NBA teams. If Atlanta lost both the Flames and the Thrashers (NHL franchises), it could lose the Hawks. That’s possible. Donald Sterling sold the Clippers for $2 billion last month. Bruce Levenson’s got next. You can take this to the bank. Mr. Levenson is about to get paid. He will walk away with far more money than he should or he would had this racially charged email never seen the light of day. That cash will bring new meaning to the term ‘ill-gotten gain.’ Dirty money – pure and simple. You may have read about Herb Vogel (1922-2012) and his wife, Dorothy Vogel (b. 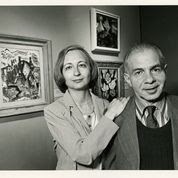 1935), contemporary art enthusiasts who bought over decades almost 5,000 works of art with their public service salaries, and stored the pieces in their New York one-bedroom apartment. And you may have seen the documentary by Megumi Sasaki about them and their collection, Herb & Dorothy, which won several awards at five film festivals after its release in 2008. A sequel, Herb & Dorothy 50 x 50, opened last year, produced and directed again by Ms. Sasaki, who gathered about $220,000 from crowd sourcing to make it. The Vogels started their collection after they got married in the 1960s, and rather than choosing works based on income potential, they bought what they liked, what they could afford, and what they could take home on the subway or in a taxi. 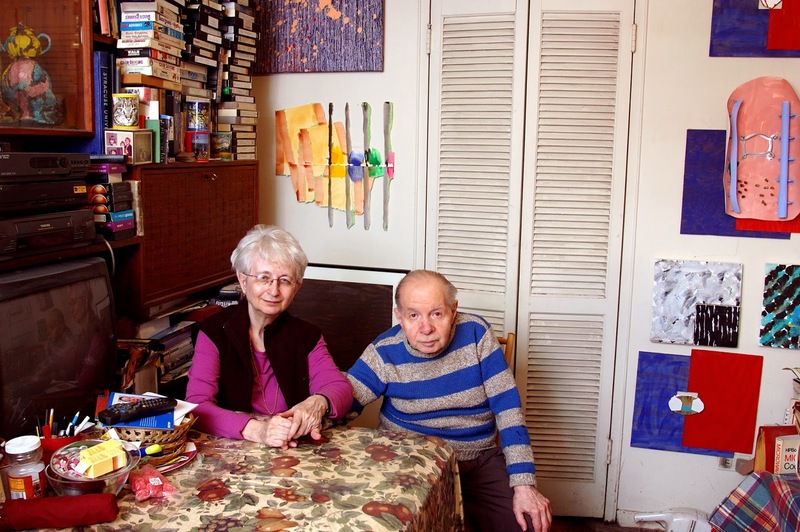 Herb was a postal worker and Dorothy, a librarian at the Brooklyn Public Library. They acquired mostly conceptual and minimalist art, and some post-minimalist pieces. Some of the artists represented in the collection were Chuck Close, Barbara Schwartz, Picasso, Judith Shea, Roy Lichtenstein, Cindy Sherman, Lorna Spencer, and Bettina Werner to name a few. (Wikipedia lists many more.) In 1992 the couple chose the National Gallery of Art as a repository for their assembly since it does not charge admission, does not sell art, and is accessible. The Vogels wanted the public to own their collection, and because of its size, they later embarked on the “50 x 50” project which distributed 50 works each to a museum in all 50 states (totaling 2,500). After Herb died, Dorothy announced that she was closing the collection. The 2013 film shows their apartment where the Vogels kept their purchases stored in boxes, under their bed, in closets, and wherever they could find space. Once the art was removed for transfer, the film’s before and after scenes show what a grand difference art can make to sad and barren walls and surroundings. A comment about the music in 50 x 50 by David Majzlin: It is magnificent, floats, and never obscures the message, capturing by instrument and note, the mood and style of the Vogels whose gifts are enthusiastically welcomed by the people of the United States, especially those who have accessibility.